In a lot of ways, dumpster diving represents the ultimate battle between thrift and dignity. Dirty, smelly, and quasi-legal, it is also a great way to save money, get great stuff, and learn about your neighbors on a whole new level. Although "trash reclamation" has probably been around since the dawn of garbage heaps, movements such as Freeganism and Freecycle have blurred the line between waste and wealth creation, ushering in a new era of dumpster diving. When I was a college freshman, I was something of a preppy; consequently, random fate and poetic irony conspired to pair me with an inveterate dumpster diver. Much of my roommate Dan's possessions came from various trash piles around campus; those that didn't were generally the product of thrift store or discount bin scouring. Although I didn't join him on his scavenging hunts, I quickly became amazed at the incredible array of items that he brought back. From furniture to clothing to computer equipment, Dan had an almost preternatural ability to jump in a pile of trash and pull out a few pieces of treasure. Part of Dan's luck came from our location. Between the fact that many students were still being supported by their parents and the fact that they often put off packing until the last moment, the dumpsters in and around campus were virtual wonderlands, filled with nearly new furniture, clothing, appliances, home furnishings and tons of other valuable items. 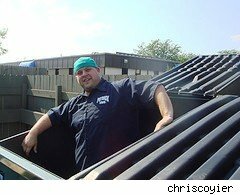 Over the years, my friend Linda and I turned dumpster diving into a sort of business. We would load up on all the items that we wanted or needed, after which we would clean the rest and drop them off at the local thrift store. A homeowner, Linda found that the tax deductions were more than worth her time. In the grand scheme of things, I was a pretty timid dumpster diver. After a few bad diaper episodes, I tended to be nervous about sealed bags, and I often turned my nose up at perfectly usable stuff. I also didn't bring home food, no matter how fresh it was. However, many dumpster divers are a lot less cowardly. Freegans, for example, are middle class people who dumpster dive for food. While I find the process a little too Manson family for my taste, I am nonetheless impressed by their devotion. In the end, regardless of whether you just find yourself eyeing a coffee table that someone has dragged to the curb or regularly jump into trash cans in search of dinner, dumpster diving has the potential to save you tons of money while offering a lot of wonderful surprises. My best dumpster diving item was an oriental carpet (I'm still not sure how Linda conned me out of it), but I have also found tables, chairs, and more clothes than I can easily count. In fact, while I haven't done it in years, I recently pulled a bed out of a trash pile. It was in perfect shape, and retailed for $149; I knew, because I had been shopping for the same exact model. Needless to say, I've started paying much closer attention to the trash piles in my area! Bruce Watson is a freelance writer, blogger, and all-around cheapskate. He recently contemplated a dining room set, but by the time he came back, it was gone. Damn you, random dumpster pirates!